Storytime this week was all about colors. This is one of my favorite themes because there is so much you can do with it. First we read A Color of His Own by Leo Lionni. This is a book all about a chameleon who wished he did not change colors and tries very hard to make that happen, but it doesn’t work out very well. Luckily, he makes a friend and they are the same together. It’s a nice story about being different and also friendship. I love Leo Lionni’s books and they always make for a great addition to storytime. This book was sort of the inspiration for the whole storytime. Next we read White Rabbit’s Color Book by Alan Baker. I thought this book would be good preparation for our craft later on. It’s a great way to introduce colors and what happens when you combine them. Finally, we finished with Brown Bear, Brown Bear What Do You See? by Bill Martin Jr., illustrated by Eric Carle. I don’t know if I could have done a color storytime and not included this book. This book is so popular and every kid in the room commented that they had read it before. I know that some librarians like to mix it up and do new books every storytime but I think that sometimes kids really like a little repetition. This was a lot of fun, every one really enjoyed identifying what colors they were wearing. This week’s craft was pretty awesome. 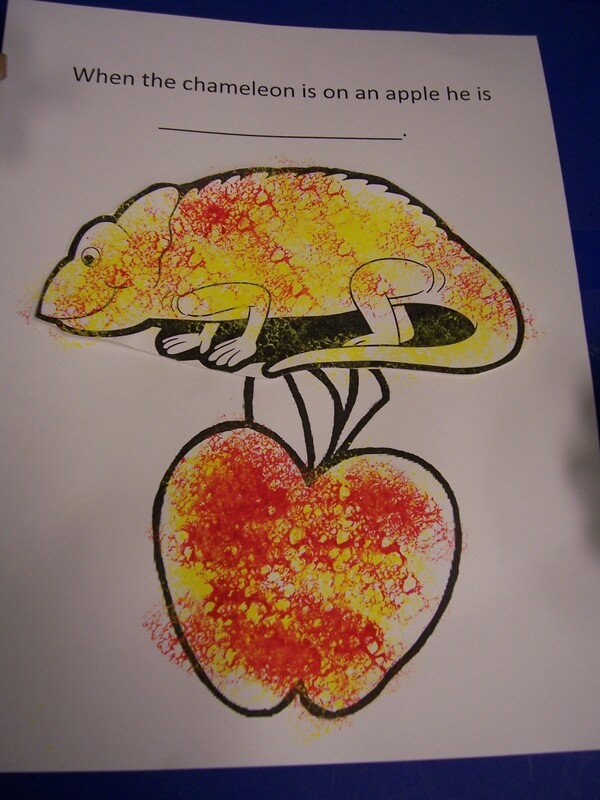 First the children glued the chameleon onto the paper and then we used closepins with pieces of sponges to sponge tempura paint onto the chameleon and the apple. 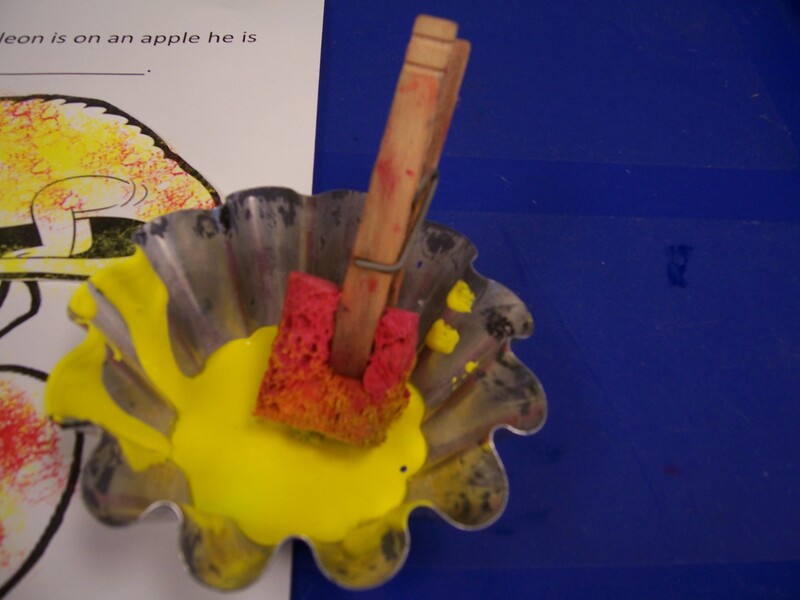 Each child was able to choose two colors and see what happened when they put them together. It was A LOT of fun.